Officials cut the ribbon on the new North Tower of the Ventura County Medical Center. 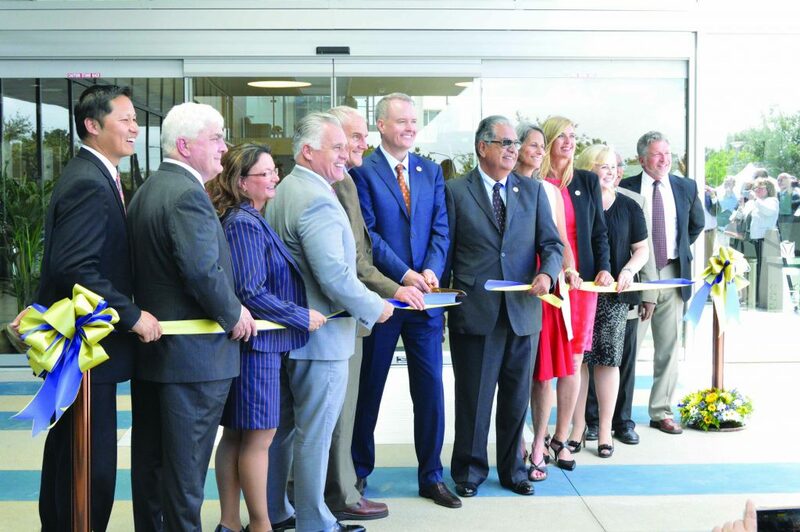 Around 250 people cheered the ribbon cutting of the new North Tower of the Ventura County Medical Center on June 9 and heard a bit of history of the county’s medical care services. In 1887, the county was struggling to meet its mission to provide service and provided most acute care in homes until a smallpox outbreak led to the dedication of $4,500 for its first hospital, said County Supervisor Steve Bennet. Later, in 1919, it offered up $90,000 for the Loma Vista Medical Center. “Today, instead of that 1887 hospital with its 1887 technology, we are dedicating and opening up one of the most modern medical centers in the world in Ventura County,” Bennet said. The new facility came in on time, within its $304 million budget and with a safety record higher than the national average, speakers said. County Executive Officer Mike Powers also praised the medical and administrative staff that will operate the facility. “Now, finally, we have a high quality facility to match the high-quality care they’ve been providing for years,” he said. Describing the new facility as the “mothership” of a countywide medical network, Powers also had kind words for the construction team that had to meet seismic standards, preserve viewsheds and keep noise and dust levels to a minimum next to a working clinic.